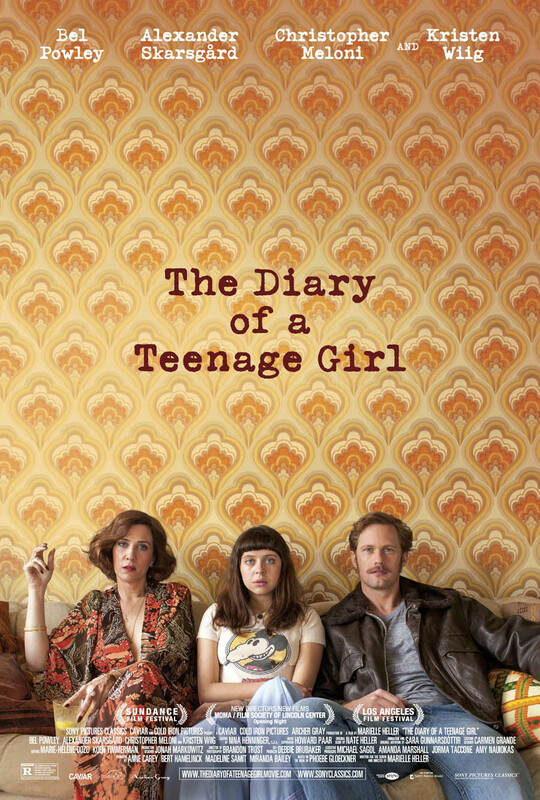 Sony Classics Pictures The Diary of a Teenage Girl in Theaters August 7th! Like most teenage girls, Minnie Goetze (Bel Powley) is longing for love, acceptance and a sense of purpose in the world. Minnie begins a complex love affair with her mother's (Kristen Wiig) boyfriend, "the handsomest man in the world," Monroe Rutherford (Alexander Skarsgård). What follows is a sharp, funny and provocative account of one girl's sexual and artistic awakening, without judgment. Set in 1976 San Francisco, THE DIARY OF A TEENAGE GIRL begins at the crossroads of the fading hippie movement and the dawn of punk rock. News commentary of the Patty Hearst trial echoes in the background, as Minnie's young expressive eyes soak in a drug-laden city in transition- where teenage rebellion and adult responsibility clash in characters lost and longing. Minnie's hard-partying mother and absent father have left her rudderless. She first finds solace in Monroe's seductive smile, and then on the backstreets of the city by the bay. Animation serves a refuge from the confusing and unstable world around her. Minnie emerges defiant- taking command of her sexuality and drawing on her newfound creative talents to reveal truths in the kind of intimate and vivid detail that can only be found in the pages of a teenage girl's diary.